A Lash Lift is a semi-permanent treatment that temporarily curls and slightly lengthens your natural lashes. It is an excellent alternative to eyelash extensions because there is no maintenance, no upkeep, nada... 24 hours after the treatment. The Lash Lift can last anywhere between 6-12 weeks! You can break-up with your lash curler for good! Am I good candidate for the lash lift? The Lash Lift is perfect for just about everyone. However, there are some exceptions. If you currently are suffering from conjunctivitis or any type of eye infection, you will have to wait until all has cleared up before the lash lift can be completed. 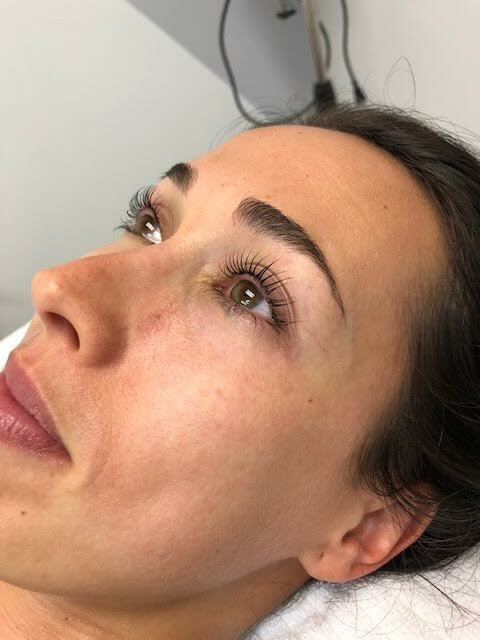 Those who suffer from chronic dry eye, lashes that have been damaged from extensions, trichotillomania, those undergoing chemo treatments are unfortunately are not candidates for the lash lift. If unsure, seeking the advice of your physician is always encouraged. How long will my lash lift appointment take? The Lash Lift treatment takes anywhere from 45-60 minutes. It is painless and actually very relaxing. Take a break and wake up with gorgeous lashes! Can the lash lift damage my natural lashes? Not at all! Be sure to see a certified and trained Elleebana Lash Lift specialist so you get optimal results. Elleebana uses conditioning and nourishing ingredients in their product. Thank you! Your $5 promo will arrive in your inbox soon. Please check junk mail, it may have been sent there the first time.